Cyanidin-3-glucoside and other Cyanidin pigment are the main parts of the Purple Corn Color. Purple corn powder is easily water-soluble or dihydroxypropane-soluble or ethanol-soluble or acetocopal-soluble, etc. It is oil-insoluble. Purple corn p.e is absolute a natural pigment abstracted from Maiz Morado or Maiz lullaby, etc .purple corn which is from Peru or other places by modern biotechnology. 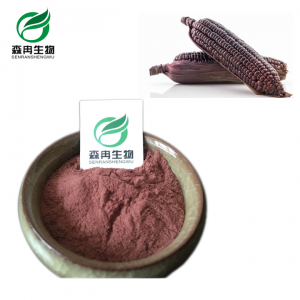 Purple Corn Extract has a hemostasis effect, can accelerate the process of blood coagulation, increase blood levels of thrombin increased platelet count. Product Name Zea mays L.